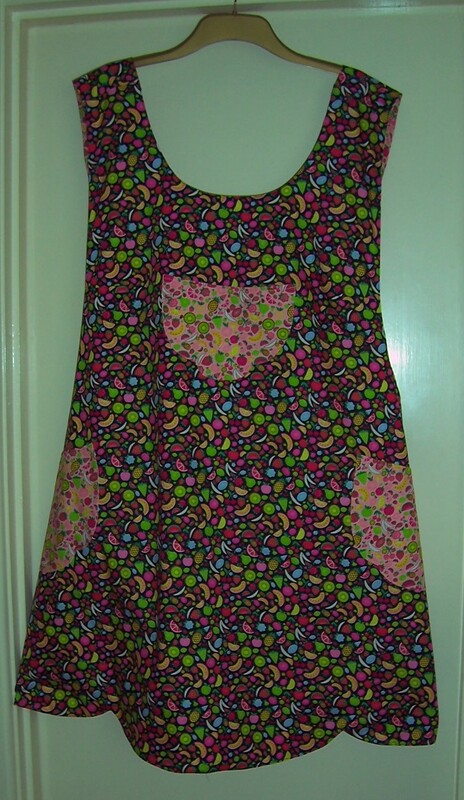 For this project I was able to use some new fabric that I bought specially for the reversible Scalloped Apron. The co-ordinated fabric is a multi-colour fruit design on backgrounds of Pale Pink and Black purchased from my favourite dressmaking fabric store – Fabricland in Salisbury. The sewing pattern is from The Paisley Pincushion based in Oregon, USA and I found it originally on someone’s Pinterest board. This is a great pattern with a wide range of sizes in the one envelope. There is a child’s size pattern for chest 20”-26” and then 3 further sizes ranging from Bust 26” up to Bust 50”. I made the large size for Bust 42” – 50” it fits well and is just the right length. The pattern envelope states that you need 2 ½ yards of each fabric but I found that by “fudging” the grainline on the back pieces I was able to cut the apron from just under 2 yards. This was just as well as I made an error when placing the front pattern pieces overlooking the fact that the fabric had a one-way design. I then had to re-cut the front pieces with the pineapples the right way up! So now I have 2 front pieces of the apron with upside down pineapples, I will have a think about these as I don’t want to waste the fabric. I may cut linings and back pieces from fabric in my stash to make a further 2 aprons to give as gifts at Christmas time. The only change that I made in the construction was to add linings to the pockets so that they could be stitched with a ¼ inch seam and then “bagged” out. This provided a much neater finish to the pockets and reflected the construction of the apron itself. 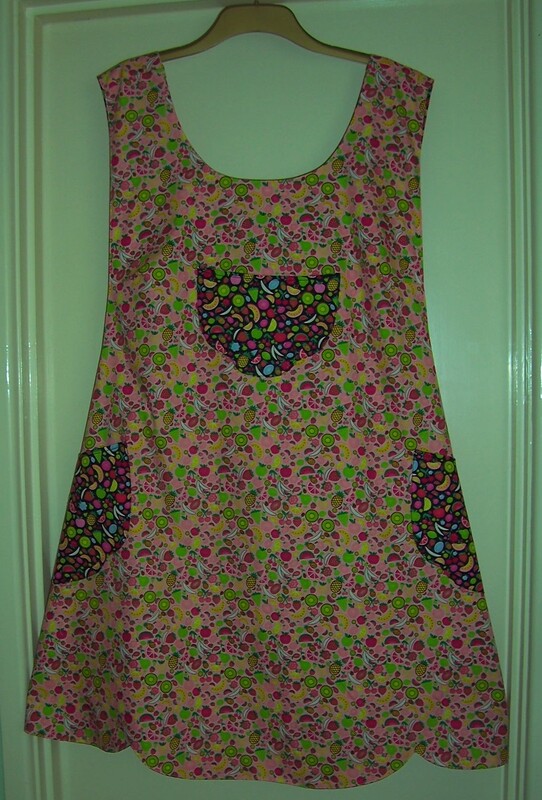 I am delighted with the end result and will definitely be making the apron again. The only alteration I will make next time is to raise the underarm by approximately 4 inches and also reduce the scallops on the back pieces to make a simple gentle curve. To use up fabrics from my stash I may try some mix and match by adding a centre front seam so that there will eventually be at least 8 different prints in the apron.